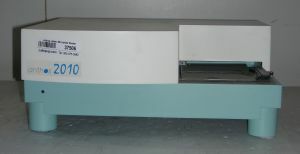 Product Description The Anthos Labtec 2010 automated Microplate reader covers the wavelength range 400-750 nm, Measurement range 0 to 3.300 OD. Filter wheel with 8 positions of which four filters are fitted as standard. Single channel system with well center. Kinetic measurment with 100 readying cycles per 45 second interba;s offers facility to handle slow reactions. Filter-based absorbance reader for routine absorbance assays in research, quality control and diagnostics. The current software "Galapagos", is required at additional cost.